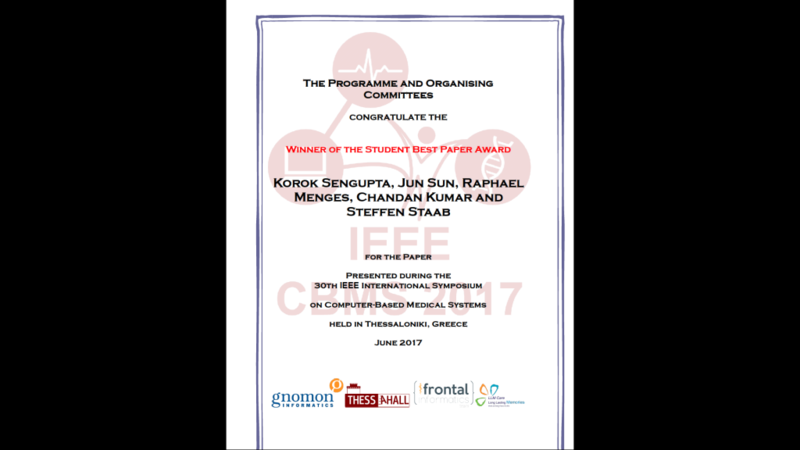 UNI KO-LD’s paper on “Analyzing the Impact of Cognitive Load in Evaluating Gaze-based Typing” received the Best Student Paper Award from the Program and Organising Committees of the 30th ΙΕΕΕ International Symposium on Computer-Based Medical Systems, that was held in Thessaloniki, Greece June 2017.
should be considered in order to improve eye typing usability. You can check the full paper in our publication list. PreviouslyCERTH team is practicing on playing Tetris using Eyes and Mind! Read NextOur paper on Combining CCA & SVMs for SSVEP-based BCIs, accepted in ACM Multimedia MMHealth Workshop!